That’s when inspiration hits you: The best way to make the night unforgettable is to scare her silly. So you start singing about ghouls and breaking out your best zombie dance moves, which definitely gets her attention. 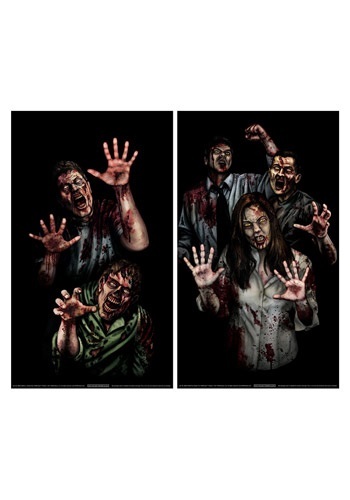 You wish you could find a group of shuffling backup dancers, or even a smooth-voiced narrator to throw in his two cents, but you’re going to have to go with the next best thing: your Zombie Asylum Window Cling. The two 3’ by 5’ posters are covered with leering zombies, drawn so realistically it looks like they’re about to smash through the glass any second. You might not be able to afford special effects like some 1980s music video, but your date will definitely freak out when she walks into your house and sees all those undead eyes staring at her from the windows. If that doesn’t make this date unforgettable, you don’t know what will.